This entry was posted in All Ideas and tagged HCT NYRT odd lots tender offers on May 13, 2014 . Disclosure: No position in HCT. Long NYRT (pending tender settlement). Watching GSOL. A substantial decline in the share price after a tender offer is a relatively common outcome when companies tender for shares above market value. It can be very difficult to obtain a borrow on stocks with pending tender offers, and the price movement afterwards lacks the certainty of the price offered by the company. However, such a strategy would not suffer from the odd lot size limitation. As a quick follow-up to the general discussion of odd lot tenders, I thought I’d highlight one other somewhat unusual occurrence that can similarly render the odd lot preference moot. Tender offers are not always oversubscribed, even if they take place above the market price. Continuing the analogy to the current market structure debate, just because a bid/ask spread is quoted does not mean that large quantities are necessarily available for purchase or sale at the NBBO. The depth of book matters too. When a company offers to repurchase shares above the market clearing price, there’s an element of price discovery that takes place: shareholders may not be willing to sell even at the higher price. This is of course extremely difficult to predict. But imagine if you could! NYRT closed at $10.25 yesterday, the deadline to tender shares via guaranteed delivery for $10.75. New York, New York, May 13, 2014 – New York REIT, Inc. (“New York REIT” or the “Company”) (NYSE: NYRT), announced today the preliminary results of its tender offer for the purchase of up to 23,255,814 shares of its common stock, which expired at 12:00 Midnight, Eastern Time, on May 12, 2014. Based on the preliminary count by DST Systems, Inc., the paying agent and depositary for the tender offer, a total of 12,903,858 shares of the Company’s common stock were properly tendered and not properly withdrawn at the purchase price of $10.75 per share, including 1,119,855 shares that were tendered through notice of guaranteed delivery. Based on the results of the offer, there weren’t 10.3m additional shares willing to sell at $10.75. But with average daily volume of 1.2m shares at a VWAP of $10.62 since listing last month, it would have been possible to accumulate and successfully tender a lot more than 99 shares. Food for thought. This entry was posted in All Ideas Mechanics and tagged HCT HFT long positions odd lots tender offers on April 16, 2014 . “Odd lot” arbitrage is one of my favorite niches of the stock market. The recent media firestorm about the costs and benefits of high-frequency trading (HFT) sparked by Michael Lewis’ latest book has prompted a lot of public hand-wringing about whether the stock market is fair to all participants. It most certainly is not. Retail stockbroking is in general marked by high commissions, significant hidden costs, sales loads, information asymmetries, and aggressive sales practices that put an individual investor at a distinct disadvantage to institutions. One thing it does not suffer from anymore, however, is high spreads (on most issues). Decimalization and market-making competition over the past few decades have significantly reduced the cost of market orders. In fairness, I haven’t had a chance to read Flash Boys, so I’m not going to join the chorus of financial market participants talking their books on the relative merits of HFT. For the record, I think the latency arbitrage HFT strategies publicized by Lewis provide a net benefit to smaller investors by lowering spreads, while making it harder for large traders to execute orders without moving the market. This unusual role reversal reminds me of another instance where the tables are turned. The arbitrage opportunity created by tender offers is another delightful corner of the stock market where investors sometimes can benefit from their smaller size. An “odd lot” or “small lot” in the US is a position of less than 100 shares. For legacy reasons, exchanges have special handling rules for odd lots, though they are now generally handled automatically. Historically, many brokerages charged additional fees for these lots, and trade pricing was disadvantageous as well. Today, odd lots do not generally incur additional costs, but at brokerages charging fixed commissions, the cost of transacting an odd lot can still be very significant relative to the transaction value. Odd Lots. The term “Odd Lots” means all Shares tendered by any person (an “Odd Lot Holder”) who owned beneficially or of record an aggregate of fewer than 100 Shares and so certifies in the appropriate place on the Letter of Transmittal and, if applicable, the Notice of Guaranteed Delivery. Odd Lots will be accepted for payment before any proration of the purchase of other tendered Shares. This priority is not available to partial tenders or to beneficial or record holders of 100 or more Shares in the aggregate, even if these holders have separate accounts or certificates representing fewer than 100 Shares. To qualify for this priority, an Odd Lot Holder must tender all Shares owned by the Odd Lot Holder in accordance with the procedures described in Section 3. By tendering in the Offer, an Odd Lot Holder who holds Shares in its name and tenders its Shares directly to the Depositary would also avoid any applicable Odd Lot discounts in a sale of the holder’s Shares. Any Odd Lot Holder wishing to tender all of its Shares pursuant to the Offer should complete the section entitled “Odd Lots” in the Letter of Transmittal and, if applicable, in the Notice of Guaranteed Delivery. The risk arbitrage set up occurs whenever shares trade below the tender price. An investor can buy 99 shares or fewer, tender at the higher price, and capture the differential within a short period of time (as little as the length of a trade settlement if guaranteed delivery is allowed). The strategy is not riskless, as tender offers can fall through for various reasons, but it is the closest thing to a freebie I have seen in the stock market. Naturally, I am not the first to discuss these opportunities. They are frequently and often breathlessly the subject of investment blogs. The holy grail of odd lot tenders occurred in 2011 when a Russian nickel company bought back shares with a 999-share odd lot preference (thanks to a 10:1 ADR ratio) at a large premium, resulting in over $10,000 profit potential per accountholder. Most tender offers are quite a bit more pedestrian, worth a few hundred dollars at most. I almost didn’t bother writing this post after finding an extensive discussion on an investor forum that chronicles almost every odd lot setup over the past year, along with various strategies for exploiting the technique and variations such as odd lot cashouts in reverse splits. There is even one enterprising individual offering a subscription service to send a notification of every upcoming tender offer, although this can be accomplished for free using a simple SEC filings search! Perhaps this literature review will nevertheless be interesting to someone. Amusingly, articles sometimes spark a backlash from commenters worried the publicity will kill the golden goose. Quite frankly, I fully expect odd lot arbitrage to disappear entirely someday, as trade commissions continue to face downward pressure. Many closed end funds that conduct periodic tender offers have already removed odd lot priority. It will likely persist as long as retail brokerages charge flat fees even for small transactions, but it’s a historical anachronism that is going away eventually. In the meantime, though, it’s a nice way to recoup some of the costs of investing. 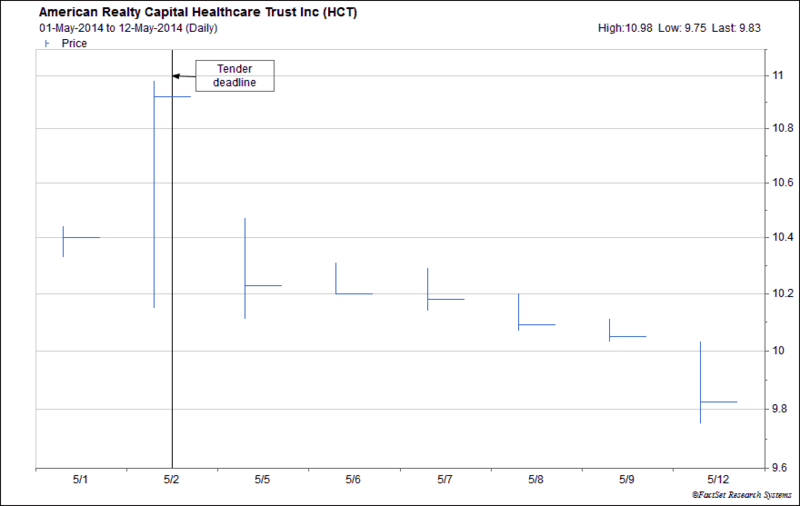 Right now, there is an opportunity in American Realty Capital Healthcare Trust (HCT), a healthcare REIT that recently listed on NASDAQ. Shares closed today at $10.20 and the company is conducting a tender at $11.00 that expires on May 2, for a potential return of $79.20 in a few weeks. Details here. As always, do your own diligence before making any investment. At the moment, there is also a less compelling opportunity in NYRT, another newly listed REIT, and a riskier tender for SPLP, which will only be profitable at the higher end of the Dutch auction range. I am watching both and will participate only if the price falls. Note from the sample SC TO-I language above that this is not a strategy that scales well for individuals. Separate accounts are expressly excluded. Each beneficial owner is limited to 99 shares. However, as an adviser, Cable Car disclaims beneficial ownership of its clients securities at the time of a tender. For multiple client accounts, odd lot arbitrage is at least worth the effort of this writing. Cable Car is presently long HCT on behalf of clients. $79.20 may not seem like much, but it is meaningful for the little guy, who sometimes does come out ahead in the end.